Unlike the Rights of the 1st Amendment to the Constitution of freedom of religion and speech, and the right to assemble and redress grievances, the Constitution does not specifically define the Right to Vote. It does describe the process of voting but does not specifically define it as a Right. It seems the founders took the Right to Vote for granted. This ambiguity in our Constitution for such a fundamental and essential function has been a cause of much contention in recent years. The ballot is the primary function of our Republic that is truly Democratic. Voting laws vary from state to state since there is no constitutional law regarding it. Some are very straight forward and encourage people of all racial and economic groups to vote with equal convenience. Some states have enacted voting laws making it more difficult for citizens of certain racial/economic groups to register to vote or to cast their ballot based upon a premise of unsubstantiated voter fraud. Add to this the rulings of the Supreme Court in Citizens United that corporations can make contributions to political campaigns and McCutcheon that a single donor can give up to $3.6 million in each election cycle, political campaigns are increasingly being influenced by well endowed special interest groups and people with lots of money. Such is now the extent of the meaning of a person and free expression. But this discussion isn’t directly about the above. It is about people who know their right to vote but choose not to exercise the only democratic process at their disposal. 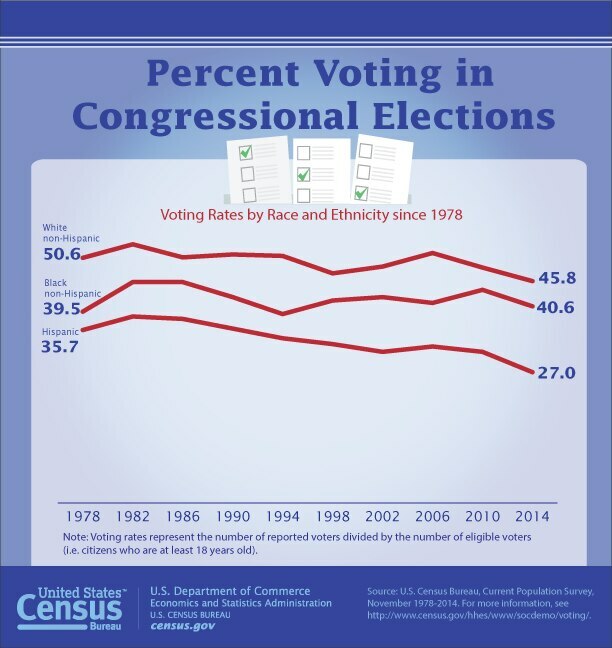 Census voting data indicates that in 2014 there were 219,900,000 citizens eligible to vote. Of these eligible voters 142,200,000 or 65% are registered. But only 92,251,000 or 42% of eligible voters voted in 2014. Why are 6 out of 10 eligible voters NOT VOTING? What is causing so much apathy that only 4 out of 10 eligible voters vote. And how many of these voters consider themselves informed voters and not simply voting down party lines. I would guess that less than 10% of voters considered themselves informed voters. So only 4% of eligible voters are voting for candidates they know will represent their values and sentiments in government. How many voters knew who they were voting for in their local government? I think less than 1%. Is our democratic process really working? Obviously Republicans are not happy with the people who represent them in government because they are largely backing Donald Trump who has no political background or ever run for public office. I’m not sure how many Democrats are dissatisfied. According to the latest Gallup poll 17% of people approve of what Congress is doing and 78% disapprove with 5% undecided. So one can guess that many Democrats also disapprove of what their representatives are doing. This is really a sad state of affairs. Much of the problem is likely due to the Supreme Court’s rulings on Citizens United and McCutcheon making it possible for big money to greatly influence and control elections. Individual small contributions count for less each year. Presidential elections now cost more than $2 billion. And each election get progressively more expensive. Elected representative start fund-raising for their next campaign the day after being sworn into office so they have less time to do the jobs they were elected for. Political campaigns are getting better at disseminating disinformation as money spent on elections explodes. I believe this is causing more people not to vote since they feel their vote has less value and counts for less with so many confusing and misleading campaign ads. Look at the downward trend of even the White votes in the graph above. So do we really have a democratic process of informed voters in the U.S? Or are elections becoming far more rigged by spin doctors and big money making each election more deceptive with false ads than the last that ultimately discourage voters from voting? Is this the real intent of big money in order to better control government? If so it is working big time. This entry was posted in Constitution, Government and tagged Apathy, big money, Citizens United, democratic process, disapprove, Donald Trump, eligible voters, informed voters, McCutcheon, not exercising right to vote, registered voters, values and sentiments, voters not voting. Bookmark the permalink. 1 Response to The RIGHT To Vote?